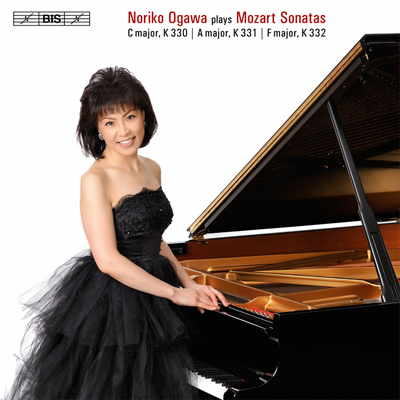 A remarkably versatile musician, Noriko Ogawa’s highly acclaimed recordings range from the recent box set of Debussy’s complete piano music (‘an exceptionally fine advocate’, BBC Music Magazine), opulent piano concertos (for instance Rachmaninov’s 2nd and 3rd Concerto: ‘luminous, electrifying performances’, Fanfare) and contemporary music (Takemitsu, Complete Solo Piano Music: ‘Ogawa has illuminated the inner recesses of these pieces’, Classic CD). She now reaches back to the classical era, with three piano sonatas by Wolfgang Amadeus Mozart. Long believed to have been composed during a visit to Paris in 1777-78, these three sonatas are often grouped together as ‘the Paris Sonatas’, but it is now established that they were in fact written – or at least first committed to paper – in 1782-83. At the time, Mozart was establishing himself in Vienna, and to that aim piano sonatas were useful in two respects: they were saleable commodities popular within the growing domestic market for printed music, but equally, they served him as material for teaching the piano to daughters of the Viennese nobility. More than 200 years later these particular sonatas remain among Mozart’s best-loved compositions, as popular for the tunefulness found in the Adagio of Sonata in F major, K 332, as for the immediacy of the ‘Alla Turca’ finale of Sonata in A major, K 331 conjuring up an image of the Turkish janissary army advancing on Vienna.